Ever need to keep your sneaky coworkers from modifying or editing your Office documents? Both Microsoft Word and Microsoft Excel have a quick way of protecting your docs and spreadsheets from deliberate and/or accidental changes. Solid Tip: Password protection in Word and Excel has been around since Office 2000. You have multiple options for restricting access in Word or Excel. In fact, Word 2010 has three different places where you can enter passwords. Click Review, then click Protect Sheet or Protect Workbook. You can hover over the two options for more details about the difference between the two. Each dialog box will have a password box. 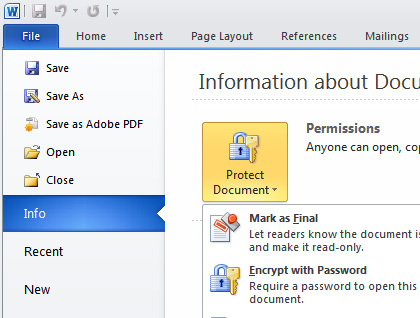 You can select individual actions that people without the password can do to the document. Click Review, then click Restrict Editing. The restriction options will pop up. If you want to simply lock your document and be done with it, click the checkbox under section 2 and hit the button under section 3. You will then be prompted for a password. If you enter the password in the boxes above, it mentions that “malicious users can edit the file and remove the password.” This method does not encrypt the password and anyone could open the document in a script editor and view the password info stored as XML. This method allows you to use an encrypted password for opening the document and also for editing. If you lose the password with this method, you are out of luck. The third method for blocking changes to your Word document are under the main program menu. 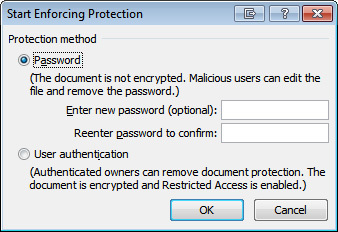 In Word/Excel 2007, you hit the round pizza button > Prepare > Encrypt Document. 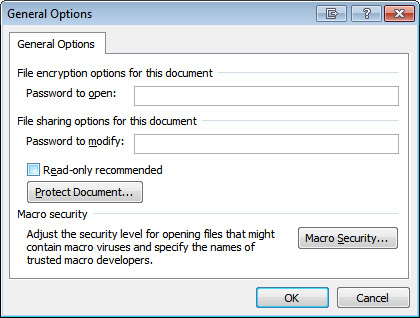 In Word/Excel 2010, you hit the “File” tab > Permissions > Encrypt with a Password. If you lose the password with this method, you are out of luck. If you just want to protect the document or sheet against accidental changes, you can use the options next to this one, called “Mark As Final.” This simply sets the file to a read-only state.